Hello everyone and welcome back to my latest Craft Room Organization Quick Tip video! 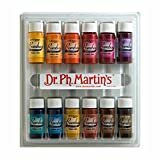 In this episode, I want to feature how I organize my Ph Martin India Inks, as well as share a bit of information with you regarding these inks. 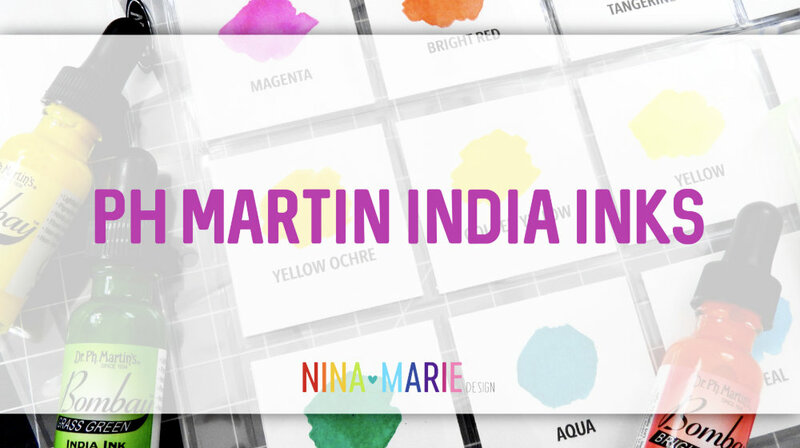 Ph Martin’s India Inks are a newer medium to me that I have been experimenting with and getting to know for a while. I just recently started sharing videos featuring these inks. My first cards that featured the India Inks were posted last Friday for the Simon Says Stamp release blog hop. The other one -which was also created for a special hop- will be posting today (April 11th) at 9 am EST. You can access the video HERE anytime after 9 am. 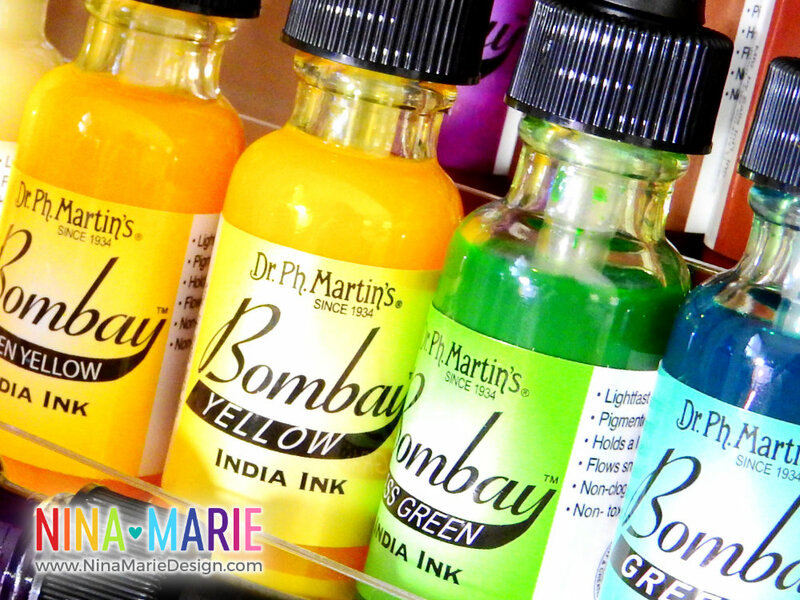 Ph Martin Bombay India inks are a permanent, non-toxic liquid pigment. They are waterproof and will not reactivate with water once dry. 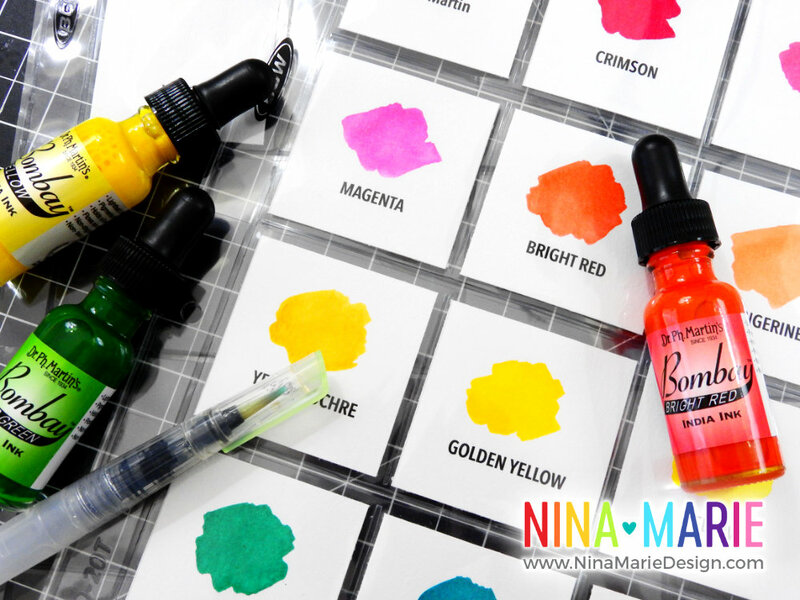 The inks can be blended together when wet. They don’t reactivate with water once they are dry. This allows me to layer the ink colors to get unique effects and I don’t have to worry about colors blending. They are extremely vibrant. You can control the vibrancy by using more or less water (more water dilutes the ink, less water results in a more pigmented color). 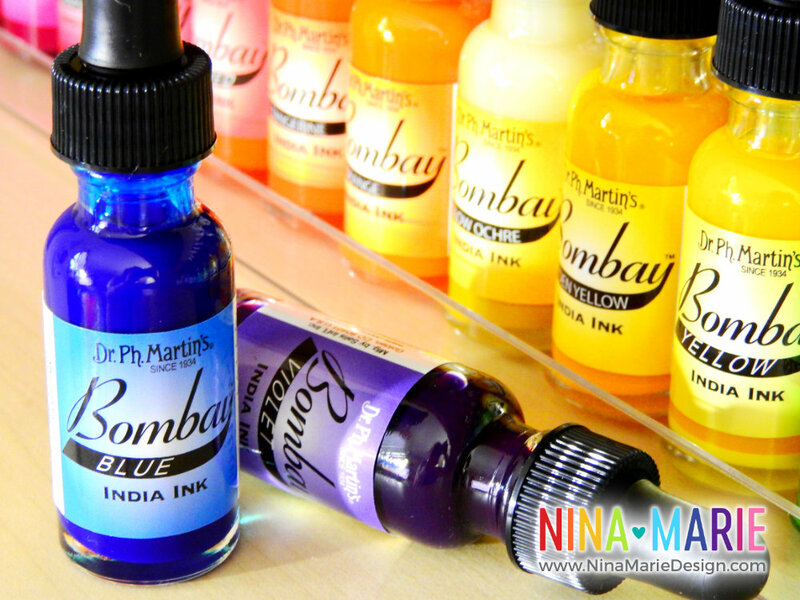 There are 24 colors in the Bombay India Ink line, which allows me to have a full color spectrum to choose from. If you are looking to have a smaller collection, I recommend choosing Set #1, as it has all the basic colors, plus black and white. Set #2 has additional color tones of the colors in Set #1. I really love the black and white inks because they are opaque. This means I can add these two colors over top of any of the other colors and the under-colors will not show through. Note that all of the other colors other than black and white are translucent. Black and white are the only opaque colors in the Bombay India ink collection. For a good quality ink set, these are reasonably priced. Will this storage method be work-friendly? Having a product stored in such a way that it LOOKS good, but lacks functionality is never a good option. Before implementing, I consider whether or not any storage method I use will actually be conducive to a productive environment. Will I have room to grow? Another point I consider is whether or not I will be able to continue to store my product in the proposed solution long-term. For the India inks, the answer is yes. Right now I have spray inks stored in the leftover space to fill the area. But eventually, this area will house only liquid watercolors and inks and the spray inks will be stored in their original location. Do I love the way it looks/will look? This is another key piece for me to think about. My motto for organization is not to create the “perfect craft space”, but to have a craft studio that FEELS perfect to me. Something that is comfortable, homey, reflects my personal style and tastes, user-friendly… a space I enjoy being in. Things don’t have to match; most of the furniture in my studio doesn’t! But I love all the pieces I have and the way I have it set up makes me happy. And THAT is what matters most. So when I select something to store a product in, I make sure I am going to love how it looks and feels in my studio. 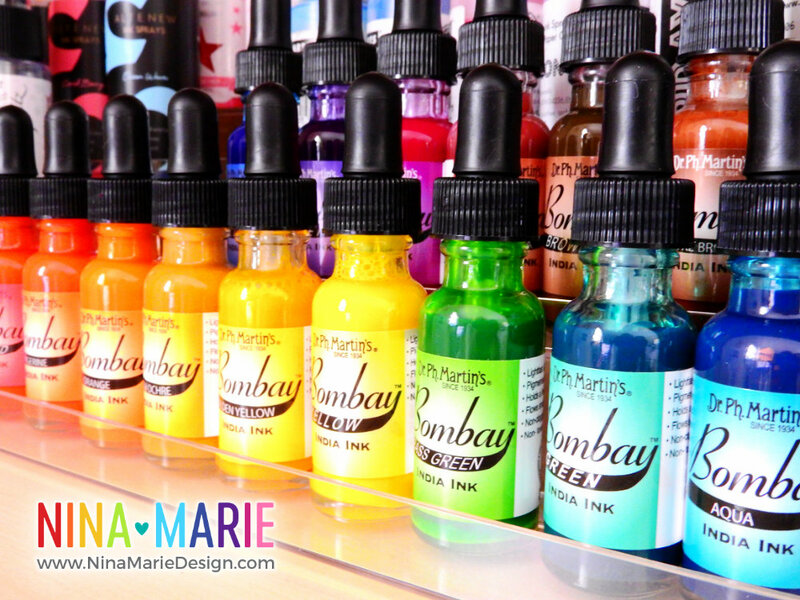 These half ounce eye dropper bottles are the perfect size for storing my India inks! I love how I can see the colors because of the clear bottle and the eye dropper allows for much better control in dispensing the inks onto a palette. 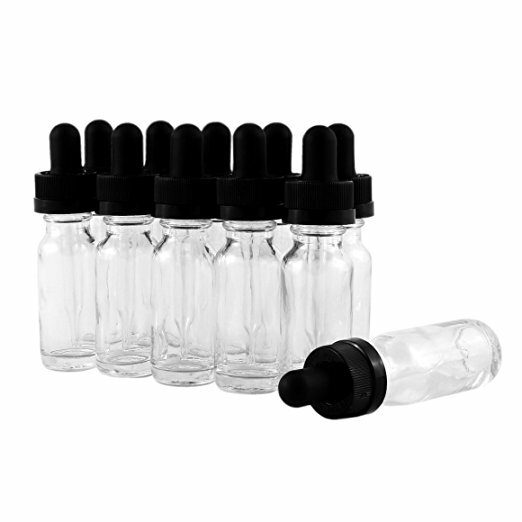 The bottles that the inks come packaged in are open-mouth bottles and it is very hard to pour a small amount onto a palette without having a lot of waste. These bottles prevent that from happening. They also are airtight, so the ink will not dry out. This tiered shelf is the PERFECT rack for storing and displaying these inks (no matter if you keep the inks in their original bottles, or transfer them to the glass eye dropper bottles). I love having all the colors showing so I can easily see which color I want to choose. It also makes for a great room decor piece because the colors are so pretty! The shelves do require some minor assembly, but its very easy and takes no more than 5 minutes. I could store 75 of these half ounce bottles on one of these racks. Currently this rack houses both the India inks and my spray ink collection, but eventually will only house liquid inks and watercolors. 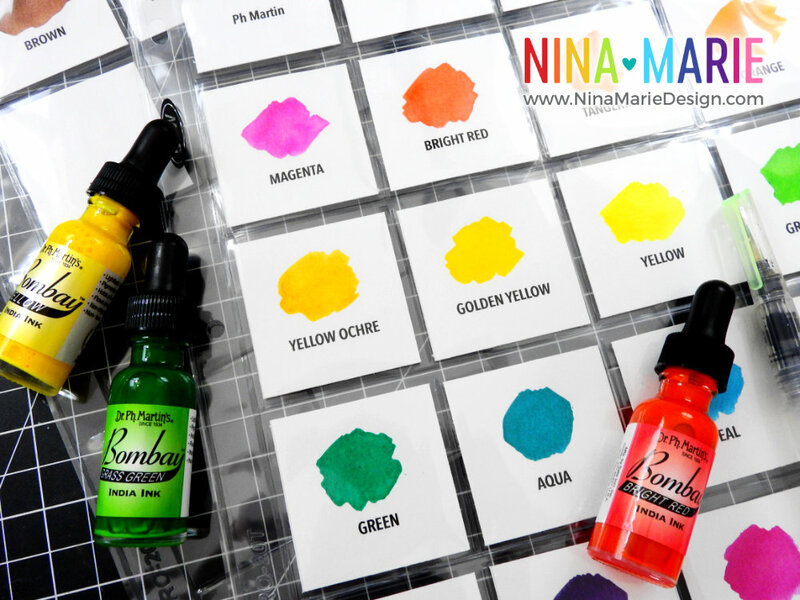 I am a big believer in having swatches for my coloring mediums, inks and other similar products where I have multiple colors to choose from. This helps me select the perfect color for my project, and assists me in keeping track of what colors I have and what colors I am missing. 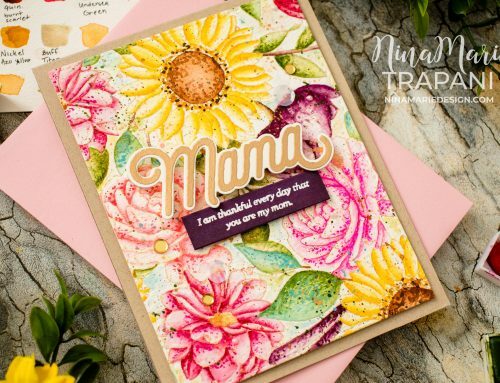 To create these swatches, I did not use regular cardstock. Because I use these inks like watercolors, I wanted to make sure I used a paper that could handle watercoloring to some level. However, I have to keep in mind that I have an HP InkJet printer that cannot handle the usual 140lb watercolor paper sheets without getting jammed. My alternative is Canson’s Mixed Media paper. This paper is 98lb (so still within a normal cardstock range that my printer can handle), and perfect for mediums such as acrylic, watercolor, pen or pencil. 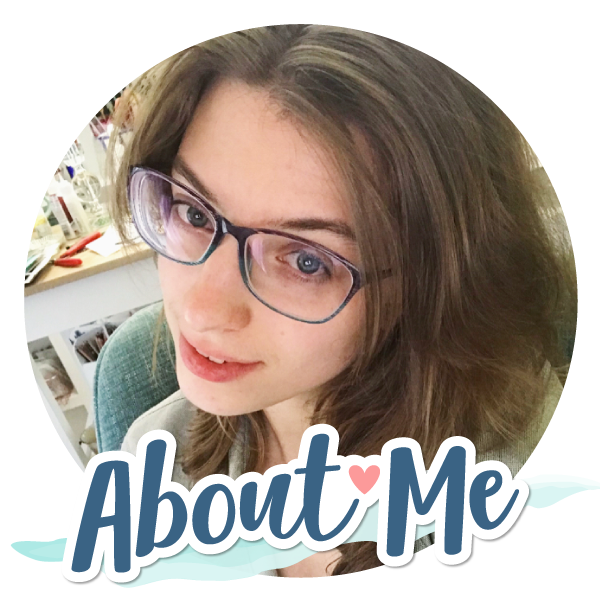 The pad I get is slightly larger than an 8.5″x11″ sheet of paper, but I just trim it down to those dimensions and I am good to go! 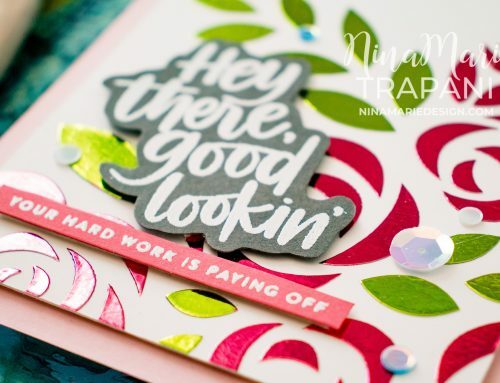 After creating the swatches, they get trimmed down and slid into 2″x2″ coin page protector sleeves, which I then have clipped into a colorful binder. 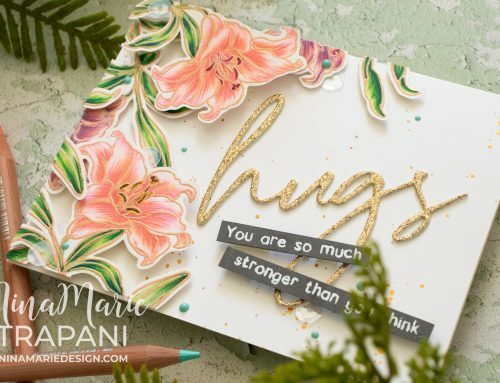 DO MORE WITH MIXED MEDIA PAPER! As a side note, this Canson's Mixed Media paper is also good for creating envelopes that can be watercolored on! Check out my most recent video showcasing this technique! Feel free to download and use the swatch sheets in your own craft space. For personal use only please. 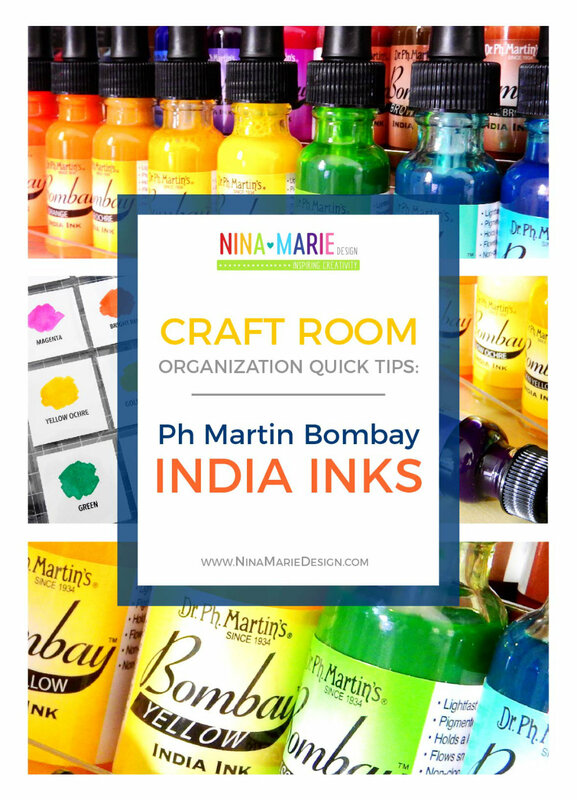 I hope that this post provides helpful information and ideas to you for storing your India inks, or any liquid watercolors. All of the tips I shared today could easily be used for whichever liquid medium you have or prefer. Be sure to check out the video below to see everything covered in this post, as well as additional details. Thanks for visiting me today, and I will see you again very soon! These inks also come in glass bottles with droppers on Amazon. Where did you get the labels for the new bottles? Hi Lindsay! I reused the bottles from the original bottles by gently peeling them off. If they were to have not come off, I would have created my own with a label maker. Love, love, love your videos! Especially when you try a product I haven’t used! Always look forward to mondays! Thanks for all you post, it’s such a great help to me! Okay, I am sold!! I just bought one set of these to try and the glass bottles. My husband is going to KILL me!! Thanks for sharing all the information on these inks. 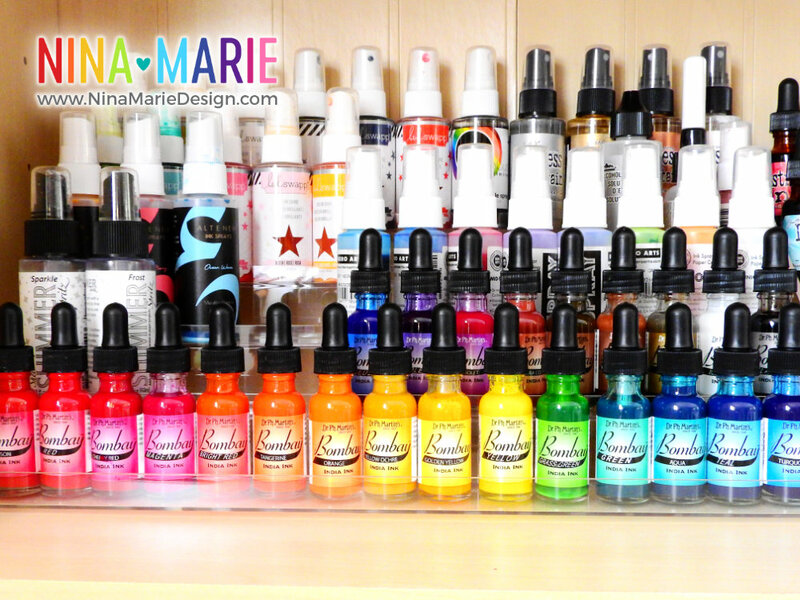 What great ideas for ink storage. Love the idea about the nail polish holder! Thank you so much for this information Nina! I was just talking about them the other day. They are on my wish list, for sure.